Selling produce and vegetables at the market can be fun and rewarding. It also can be and should be profitable. We want to share the article below. First thing is make sure you plan ahead. Determine what your costs truly are and how much money do you realistically want to make by selling your produce to visitors at the farmers market. This can be difficult, especially when it comes to determining your costs. How much is your time worth? How many hours did you spend planting seeds, harvesting etc… How much is your time worth driving to the market, setting up your produce stand? How much is your time worth selling strawberries to consumers for four hours? These are challenging questions and there is no right or wrong answer but if you can put a number(s) on some of these questions, it can help you truly determine if you made any money selling fruits and vegetables at the farmers market. Next, scout your competitors locations at the market. Is a seller four tables down selling apples for twenty five cents less than you? Can you match that sellers price and still be profitable? Is there a particular fruit or vegetable that seems to be really popular this year with customers? Perhaps you can source some of those for your table or at least make notes so you can grow that for next year. Do you have any larger expenses to consider such as buying a new digital price calculating scale? Or perhaps you had an existing scale repaired with new keypad, battery, and AC adapter. Or maybe you need to invest in some type of cash register or large covered tent to protect you from the blazing July sunshine. All of these costs need to be considered in your calculations. Summarizing, no one understands your buying / selling produce at the farmers market business better than you. You know how much work that you have put into growing or sourcing your produce. You know how much work you have put in to buying supplies and preparing each week for the market. And you know how much money you would realistically like to make each week and throughout the year. This article is just designed to make you think a little bit and perhaps help you to remember an area that you might have overlooked. There are many fruits and vegetables available. And, we all know that we need to be eating more of them. Today we wanted to take a look at apples. We all know the phrase an apple a day keeps the doctor away but did you know the apple facts below? 1. Fighting bad breath. Apples contain pectin, which helps control food odors. Pectin also promotes saliva, which cleanses breath. 2. Preventing asthma attacks. Asthma sufferers often have low levels of antioxidants. Apples are high in vitamin C and flavonoids (beneficial, water-soluble plant pigments). Both are antioxidant. One study found that vitamin C supplements helped protect against exercise-induced asthma. 3. Reducing the risk of stroke. A study involving 9,208 men and women showed that those who ate the most apples over a 28-year period had the lowest risk for stroke. Researchers concluded that the results suggest the intake of apples is related to a decreased risk of thrombotic stroke. 4. Preventing constipation. Fresh apples are high in fiber, which adds bulk to the stool. Apples contain both soluble and insoluble fiber, or roughage. 5. Combating fatigue. The high vitamin C and antioxidant content in apples counter the free radicals leading to oxidative stress, which has been linked to fatigue. You can see the entire article here. There’s no question apples are great for you and with all the different varieties that are available, you’re sure to find a couple of varieties that you love. You’ll be treating yourself to a great snack and helping your body as well. 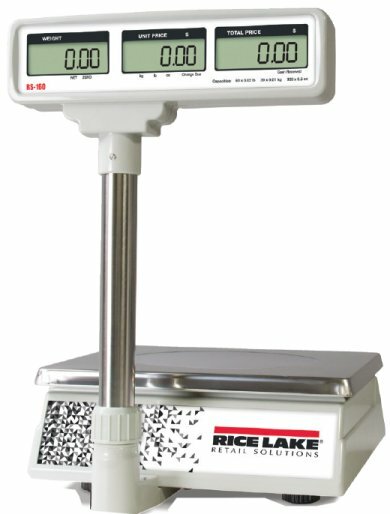 We’ve discussed the Rice Lake RS130 retail scale for years. It’s a nice price computing scale that works really well for almost every basic retail application you can think of. 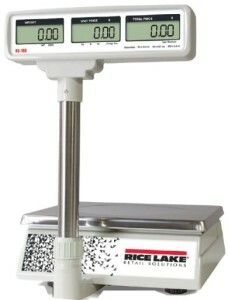 Some of the key features include choice of weighing units including “ounces”. The scale also has internal rechargeable battery and much more. Now Rice Lake has expanded the product line to include tower displays and a 60 pound maximum capacity. 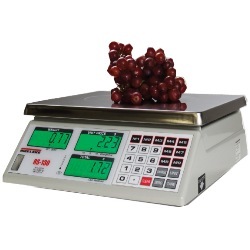 The RS-130 and RS-160 retail scales are the ultimate choice for simple price computing applications. Delivering unmatched convenience and accuracy, the RS-130 and RS-160 provide one-button operation with weight displays in pounds, kilograms or ounces. The RS-130 has a 30-pound capacity and the RS-160 has a 60-pound capacity. For added convenience, the RS-130 and RS-160 can toggle units of measure and save tare, price and nine direct price lookups. Cash back calculation allows you to quickly provide cash back for applications where a cash register is not present. The scales’ large, stainless steel platters provide ample room for product, and standard in-use covers assure years of trouble-free operation. The RS-130 and RS-160 are powered by an included rechargeable battery, and a low-battery annunciator signals the operator when it’s time to recharge. The RS-130 and RS-160 are NTEP Certified and offer the most accurate, portable and affordable solutions for simple price computing needs. Now that the warm weather is starting to fade away and Thanksgiving is right around the corner, this is usually a good time to start planning how you’re going to store your digital scale during the “offseason”. This is assuming that you don’t sell in some of the winter markets that are becoming more popular. So, if you’re not going to be using your scale for awhile it’s a good time to plan how you’re going to store the scale. Ideally, if you have the original box it is nice to store it in the original box with packing material. If you don’t have that, then try to find some kind of box that will allow you to safely store the scale so no damage gets done to it during the busy fall and winter months while you’re putting Thanksgiving decorations up and getting your Christmas decorations out of the attic. Be sure to include the AC Adapter and instruction book with your scale to make sure you have it when next season rolls around. You might want to contact your scale manufacturer and ask how they recommend you store your scale if you have an internal rechargeable battery. Hopefully by planning ahead and keeping your scale in a safe place you will be ahead of the game in 2016. Of course, when spring rolls around we have a list of things we recommend for making sure your scale is working good for the upcoming market season. The 16th annual Farmers’ Market Week runs from Sunday August 2nd through Saturday, August 8th. Of course we all know Farmers Markets are a great thing. The wonderful fruits and vegetables provide local customers with nutritious produce and provide local farmers with a relatively easy way to market their goods. The Santa Fe Market operates three times a week and draws as many as 5,000 visitors a day during its peak season. It is also one of more than 6,400 farmers markets across the country that accepts Supplemental Nutrition Assistance Program (SNAP) benefits as payment. AMS and USDA’s Food and Nutrition Service (FNS) work together to help farmers markets accept SNAP benefits, giving recipients access to healthy foods, expanding the customer base for farmers, and encouraging the sale of local produce. So be sure to get out your local farmers market this week and support your local market(s) in your area. In fact, many are offering specials and a chance to try a few of the goodies out before you purchase. If you’re interested in selling your vegetables at a local market, be sure to check out this site for additional tips for sellers who are looking to buy a certified scale. Believe it or not there are differences between different manufacturers of scale labels. 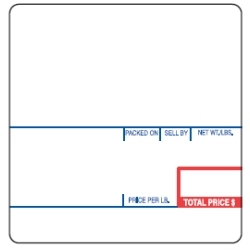 If you own a label printing scale then you realize the need for affordable scale labels that are in stock. The recommended label of choice would be the products that the manufacturers offer. You can obtain high quality CAS scale labels and Ishida scale labels from Central Carolina Scale located in Sanford, NC. The labels that are supplied are high quality, manufacturer provided labels that feature vibrant color and good adhesive. There are a wide variety of choices available from labels with safe handling instructions to labels with room to print a bar code. Contact the sales team at (919) 776-7737 for price quotes and lead times. In the majority of cases, the labels can ship out the same day the order is placed. Also, if you’re looking for other scale manufacturers labels such as TEC, Digi, Berkel, Toledo etc… Central Carolina Scale can assist you in most cases with those as well. If you ask a lot of small farmers around the country they’ll tell you a similar story. They started out just planting a few crops here and there and over the course of a few months or a few years, their crops grew and grew to the point where they could start selling their fresh fruits and vegetables to friends or neighbors. Fortunately for many of them a local farmers market is nearby and provides a great location to sell fresh vegetables. In fact, there are literally thousands of farmers markets throughout the U.S. and more customers are demanding fresh home grown produce. We suggest you check out a farmers market first before you take the plunge. See what sellers are peddling and what are the average price per pound for each type of fruit and vegetable. What type of scales are the sellers using? If you’re new to selling at the market, there are a few insider secrets you should know as well. Ideally, you’ll identify a potential farmers’ market the year before you want to start selling and visit it several times during the season. Get a feel for the market and attendance flow. Is there enough shopper volume to justify more vendors? Understand the regulations of the particular farmers’ market you’re considering selling at. Ask the market manager questions, and make sure you can commit to the expectations. For example, you may inquire about rules regarding what you can sell. Some markets are “producer only,” which typically means you can only sell things you grew yourself, whereas others may allow you to resell other items or include things like crafts. Don’t go overboard—test the farmers’-market waters before investing in expensive tents and gear. See if you can find a market where you can sell as a “daily vendor” to get started. These are markets that will let you commit to one market at a time depending on available space. This way, you can get a feel for selling at the farmers’ market without over-committing. As you do these trial sales, take into account your driving time and costs and sales volume to determine if this particular market is a good long-term fit. How is what you’re selling different than other vendors at the farmers’ market? Sometimes it helps to specialize in selling varietals of one distinct item, such as garlic. Another route is to creatively package your items. Sure, a lot of farmers may be selling red, ripe tomatoes, but what if you sold green tomatoes, along with your recipe for fried green tomatoes?